So today is my first day of Signalling school, so what better time to share with you my latest finished project – a new Pencil case. I used some spare Scheepjes Catona I had in my stash from when I made a gingerbread house Christmas wreath last Christmas. The wreath required double stranded crochet so I still had a ball of double wound Catona languishing in my stash. So out it came, to make me a small pencil case. I didn’t follow a pattern – I made it up as I went along. And once I finish Signalling school and no longer need it to transport my pens to and fro, I can use it to transport crochet hoos instead. Bonus! My first finished objects of April. A set of 4 crocheted roses. Wow isnt black had to photograph! Anyways, they were easy enough to make. The smallest 2 were made using a foundation chain of 30. I then Sc into each chain space 30 times. On the final row, I created the petals by simply skipping 1 stitch, Dc 5 times into the next stitch and ss into the next stitch until the end. For the medium sized rose, I started with a foundation chain of 90. And did the same as the smallest soed, the only difference being that instead of a row of Sc I did Hdc instead. Finally for the largest rose I used a foundation chain of 150. On the second row I did 50 Sc, then 50 Hdc the 50 Dc. Then on the final row continued as with the other two roses. Finally I sewed them all up in a spiral to create the rose shape. I intend to use the 3 smaller ones on my pill box hat with some dark green tipped feathers and perhaps some net and ribbon. The larger rose will ne used to make a matching brooch to fasten my (faux) fur collar. Hello all. Another project finished perfectly in time for a FO Friday post. Wonders will never cease. Popping in to share with you my locker pouches that i have been making to organise my locker at work. Dont you just love the colours. In order of when I made them. The first was done with a starter chain of 20 and SC stitch all the way around. The second was done with a starter chain of 10, but with a slight gusset to make it slightly deeper and DC stitch. The third was done the same way with a starter chain of 30. The fourth was done using 2 basic granny squares stitched together with a row of SC. And the final one was done with a starter chain of 24 and HDC all around. And now, with the small amount of yarn I have left from this project, I might reward myself with an octo… only the one though, since I still have 2 substantial WIP’s to get a mooch on with. just popping in to share with you some recent purchases. 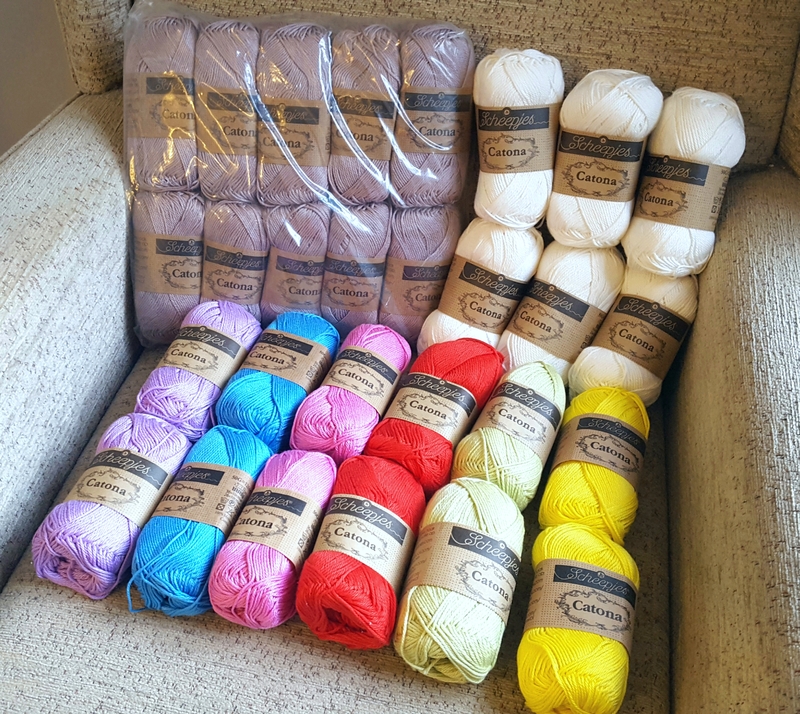 I have recently ordered a whole load of Scheepjes Catona. Isnt it marvelous! I bought all of this so I can make some of the christmassy bits in last christmas’ edition of Simply Crochet Magazine. Now I have a book nook I have a mind to make into a little candy wonderland when I decorate for christmas! A pink tree with candy coloured decorations and gingerbread houses and pompom garlands and the like. Whilst I am here, let me also show you the yarn I splashed out on in The Yarn Dispensary. It is 4ply Britsilk by the Knitting Goddess, in Blackened Rainbow. It was expensive (almost £20) but it was gorgeous! Worth every penny. This is by far the most expensive yarn I have ever bought though, So it will take a while to work out what I want to do with it. The project just needs to be perfect!